For some people, a lottery ticket means the promise of a better life. For artist David Jelinek it was a reminder of pain. In 2010 David Jelinek and his wife decided to divorce. That weekend he was involved in a car crash, flew ten feet into the air, and lost all hearing in one ear. Could life get any worse? For Jelinek it came in the form of lottery tickets. He noticed a discarded ticket on the ground and was struck by how the scratched-off silver numbers mixed with the neon colored card. He picked it up, stuck it into his back pocket, and began a collection of lottery tickets that would eventually fill three suitcases. This collection birthed the exhibition Money Down at the Andrew Edlin Gallery in Chelsea in 2013. 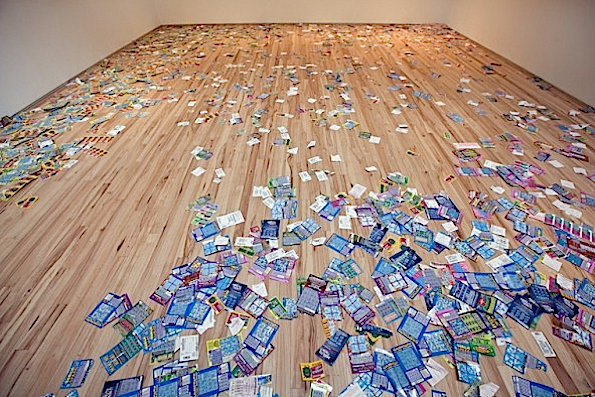 The installation featured tens of thousands of dollars in discarded tickets, scattered across the gallery floor. As writer Nandita Raghuram points out, the tickets simultaneously represent both hope and hope lost. A ticket that has yet to be played still holds a promise, but within seconds, after the flashy silver has been scratched off by fingernails or car keys, its value decreases a millionfold.